Dill, shrimp and a hint of vinegar shine in this light, veggie-filled dish. Thaw shrimp, if frozen. In a large saucepan, bring 2 quarts water to boiling. Add asparagus and cook 2 minutes or until tender but still firm. Reserving water in saucepan, remove asparagus with a slotted spoon and transfer to a bowl of ice water. Return water in saucepan to boiling. Add orzo and cook, uncovered, for 9 to 11 minutes or until al dente. Drain, reserving 1/2 cup pasta water. Meanwhile, peel and devein shrimp. (Leave tails on if desired.) Rinse shrimp; set aside. In a large skillet, heat olive oil over medium heat. 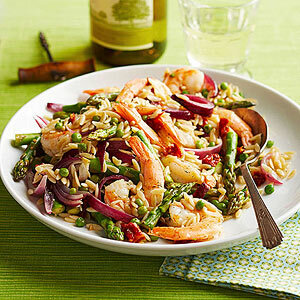 Add shrimp, onion and garlic; cook and stir 3 minutes or until shrimp are opaque. Stir in vinegar, salt, dillweed and pepper. Add tomatoes, peas, pasta, reserved pasta water and asparagus. Cook and gently stir until heated through. Shrimp shopping* Larger, pricier shrimp mean fewer to peel. Smaller shrimp give you more crustaceans for your money but add prep time. If using shrimp that's pre-cooked, add to skillet with the sauce and just heat through. Variation Serve warm out of the skillet or cold as a pasta salad.